I'm proud to say that I've made some fantastic new additions to my wardrobe over the last few months. However, I was beginning to detect that some of them were at risk of being classified orphans, or near-orphans, (i.e., they went with little else in my current clothing selection). So I turned to my own trusty Dolores batwing pattern to whip up a couple of tops to fill the gaps. The stripy version (pictured above, paired my with my Cleo pinafore) was made using some lovely merlot and white striped jersey that was kindly sent to me to review by Girl Charlee. I wasn't sure what the properties of this fabric would be until I received it, and when I did I knew instantly that it would be perfect for the Dolores batwing pattern. I'd describe it as light-to-medium weight, buttery soft with an amazing drape. I love that the pairing of this fabric and the long-sleeved version of this pattern create an interesting alternative to the standard Breton top. Second-up is a Dolores batwing top fearturing the short-sleeved option. Because my upper arms are proportionally slightly chunkier compared to the rest of me, I cut the size 14 sleeve bands and the size 12 for the rest of it. Although with my current slightly fuller-than-normal belly (NOT pregnant, before you ask), I possibly could have done with grading out to the size 14 at the waist as well! The fabric is some equally lovely drape-y pinstriped jersey from Fabric Godmother, this time paid for with my own money at one of their open days. It's a viscose mixed with lurex and it feels slinky and divine. The piece I bought was an end of roll, but lucky you because they have since been able to restock. I used the leftovers to make some capri-length leggings (pattern review coming soon) and a pair of pants for Dolores-the-child-not-the-pattern. However, she has informed me that the pants don't stay up very well, in hindsight I can see that this jersey has some mechanical stretch but not fibre stretch, so these pants live in her nursery bag in case of accidents. Anyways, despite the looseness, I think the #2018makenine compilation is a fun and worthwhile thing to make. It encourages sewers map out some well-considered projects which will hopefully therefore lead to successful and often-worn wardrobe additions. When it's all typed out like that it seems like a lot of sewing, doesn't it? However, as I write this, I have already completed three and a half of these projects, so I know that I haven't bitten off more than I can chew or heaped some weird and unnecessary pressure on to myself! Plus, the majority of these projects have been something I've wanted to undertake for a year or more, so I'm sure that each of these (if they fit me well), will eventually become wardrobe workhorses. I made a coat. *mic drop*. (*Picks mic back up to continue talking about this project*). So far this winter, like last winter, I've been making do with a 70's retro, fluffy faux-fur jacket that I bought over a decade ago. It keeps my torso toasty, but my bum and thighs bear the brunt of the cold. And seeing as I'm managing to carve out quite a bit of sewing time for myself these days, I thought that now would be a good opportunity to take on a major sewing project. 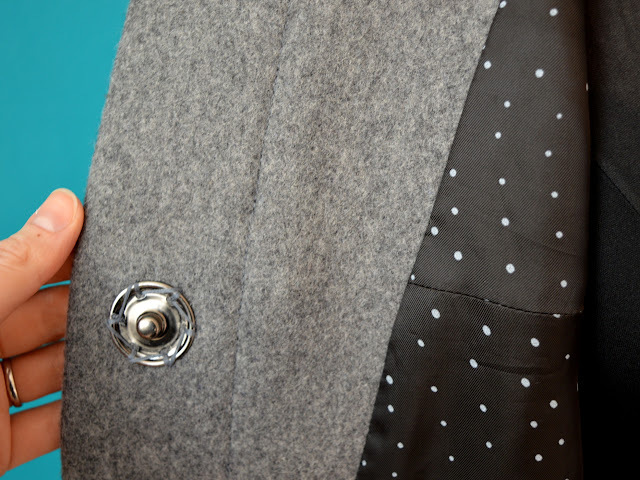 Enter: the coat. 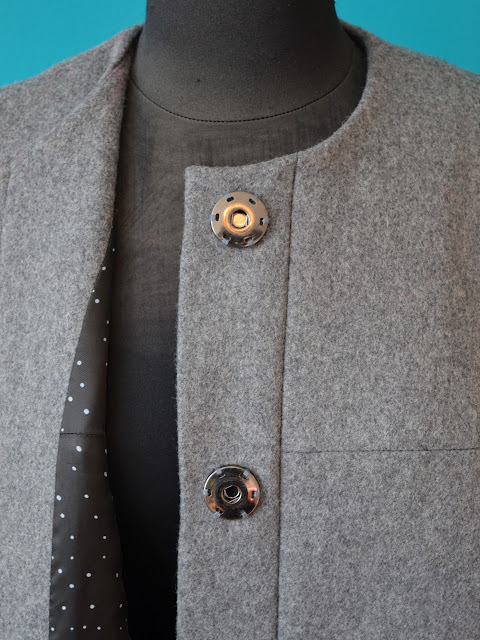 I loved the interesting seam lines that attach the grown-on sleeves, the simple rounded neckline, concealed fastenings that meant I could avoid making buttonholes, and the overall volume. Sold. Now, despite the simplicity of the coat design, I knew this project was going to be a job of work. My first two coat projects (my leopard coat, and blue wool coat) nearly broke me, and I was determined not to hate this experience. 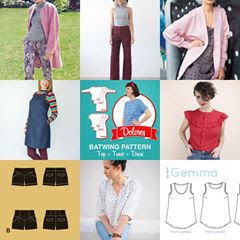 So I took my time; I gave myself no particular deadline (it ended up taking about three weeks) and I worked on it along side some other, simpler projects that could be made almost entirely with my overlocker. The PDF coat pattern consisted of a whopping 54 pages. 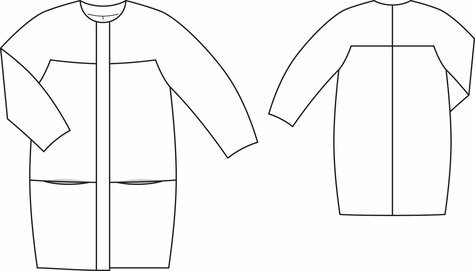 It was a little confusing because Burdastyle have lumped a few style variations of the same basic coat into one PDF, so there are some pattern pieces and cutting lines you need to ignore, and a couple of pattern pieces you need to draft from scratch yourself. Then there's the seam allowances to add, what with it being a Burdastyle pattern and all. Man, the instructions were sparse. No step-by-step illustrations or photos with very limited explanations for each step. I would not have liked this to have been my first ever coat project. 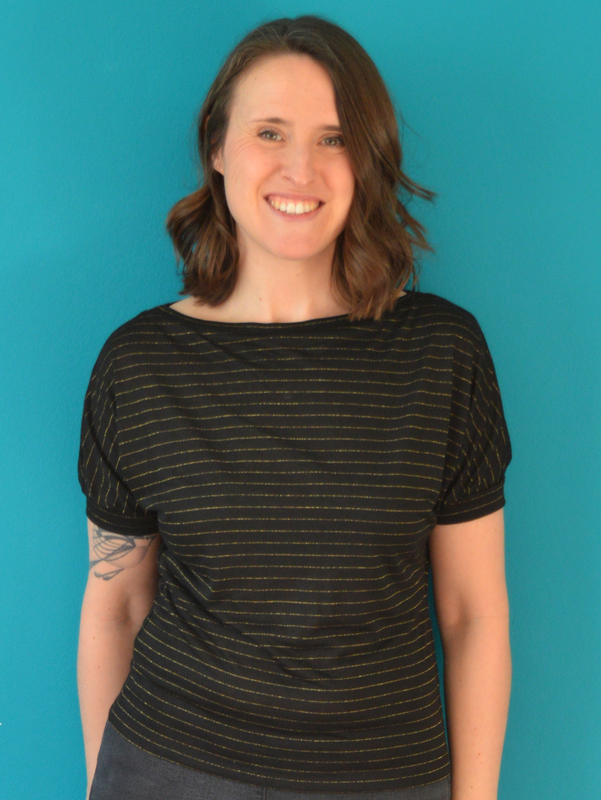 You can buy an online video via Burdastyle to talk you through the construction, but I resented the idea that I'd bought a pattern that was so lacking in detail that it was necessary to shell out an additional $19.99 for the privilege of being able to use it. I did find watching the 10 minute free taster useful though. Oh, and I may well have missed something, but I found the pattern and instructions lacking entirely when it came to creating the front lining pattern piece. There seems to be very few reviews of this pattern online, so I was having to guess where there may be issues. It did appear that this coat comes out BIG. In fact, the finished coat that was being made during the online video can be seen here. The woman that made it makes light of it (probably because she's employed by Burdastyle) but it's clearly come out so massive that she decided to make some changes, like adding waist elastic to bring the volume under control, and to stitch the front edges down like lapels. 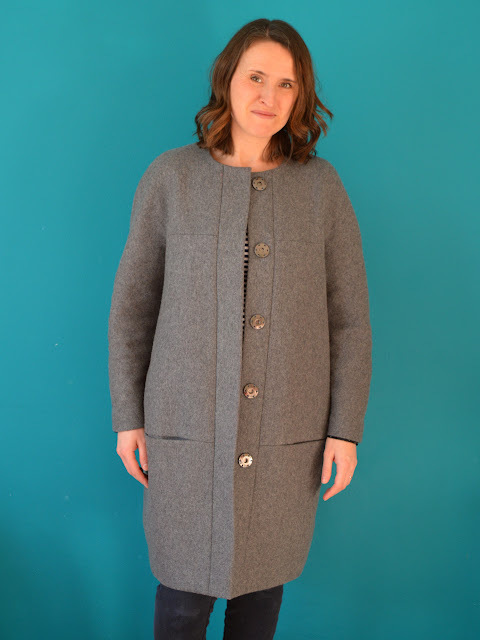 I find that Burdastyle patterns often come up really large anyway, so I cut out the smallest size included in the pattern, which was a full two sizes smaller than my measurements would have suggested I use. 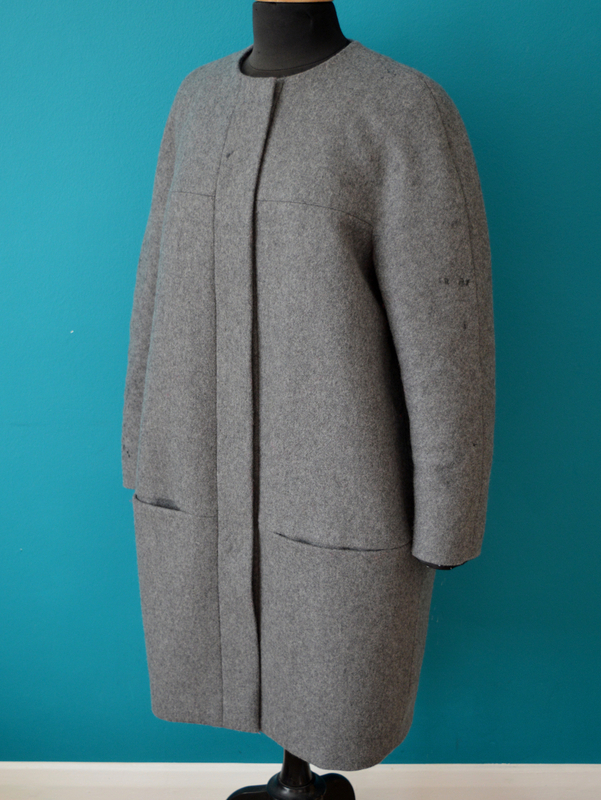 As I began to construct the coat, it became clear that the fit was somewhat insane. I tried on the outer shell and showed it to Pat, and ended up laughing so much I nearly wet myself. The sleeves were so large and curved that I looked like a cartoon gorilla. I spent ages pinning out a bit, stitching it, then trying on and repeat, until I got a shape and volume I was happy with. I think I pinched out a good 4cm from the bicep in the end, so that's taking 8cm of circumference from each sleeve. I also brought the side seams around the waist in a touch too. Aside from the sizing and reshaping, the the other ways I veered from the pattern was to interface everything (more on that in a bit) and to hand stitch down all (ALL) the seam allowances inside to help them lie flat. I've had this gorgeous ex-big-name-designer wool that came from a previous place of employment in my stash for over five years. I ended up using about 2.5m for this project, and I still have about that same amount left. This fabric was destined to be a coat, however I questioned that it was thick enough for this pattern. 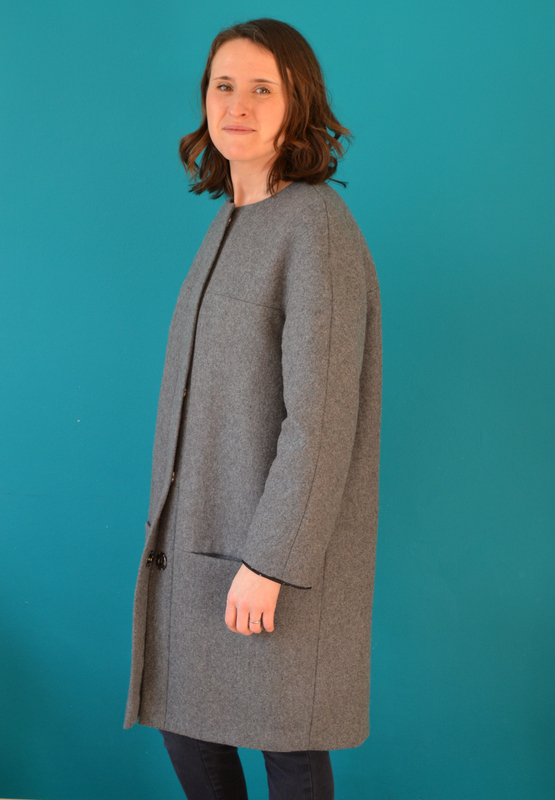 I had read Marilla Walker's blog post about her beautiful Honetone coat and been really impressed by how the interfacing she'd used kept her outer fabric so smooth. Luckily, she had included a link to where she bought her interfacing, and I followed suit. I fused all my wool pieces, and I'm so glad that I did. After several weeks of daily wear, my coat still holds its shape wonderfully. I could have continued to channel Marilla during this coat project and used quilted lining for extra warmth, however I already had this amazing spotty lining from Merchant and Mills in my stash. I bought it a couple of years ago when I visited their bricks and mortar shop in Rye. I rarely buy fabric unless I have a clear idea of which project I'm going to use it for, but I thought this was such a classy and unusual lining that I bought 2m on spec. 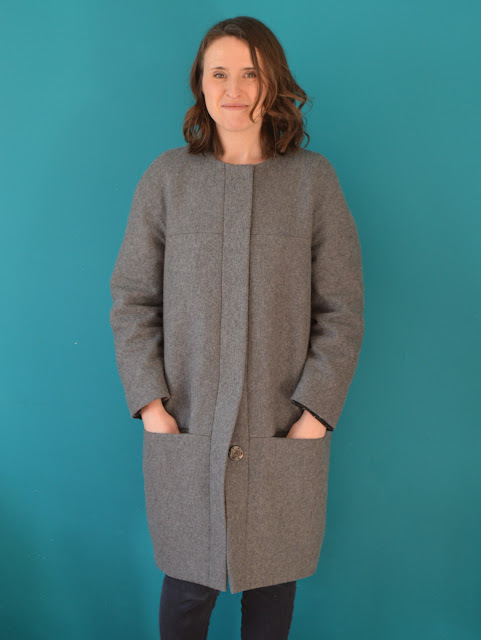 I was aiming to make a simple, practical coat with a retro vibe, however I seem to have made a classy, modern one instead. I'm not sure it's very 'me', but I think I'm going to grow in to it, stylistically speaking. Even my mum nearly walked past me the other day when I was wearing it because she didn't recognise me. Plus, there's something else I've noticed about it. You know how people who know you sew often ask you, 'Did you make that top?' or 'Did you make those trousers?' when they see you? No one has asked if I made this coat. I'm not sure if it's because it looks shop-bought, or because it doesn't look like something I'd make. I also must admit that it's not the warmest coat ever made. A quilted lining would have definitely have made it warmer, but it has sufficient volume to layer up underneath and it looks great with the hot pink scarf my mum bought me. 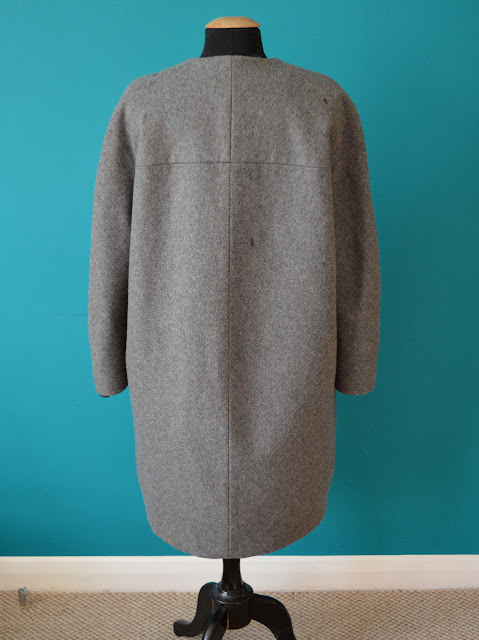 Plus, with my chosen lining, I'll be able to wear this coat from October to May (though I hope I don't have to). And yes. I do know that I need to fix the lining that's peeking out from my left sleeve. 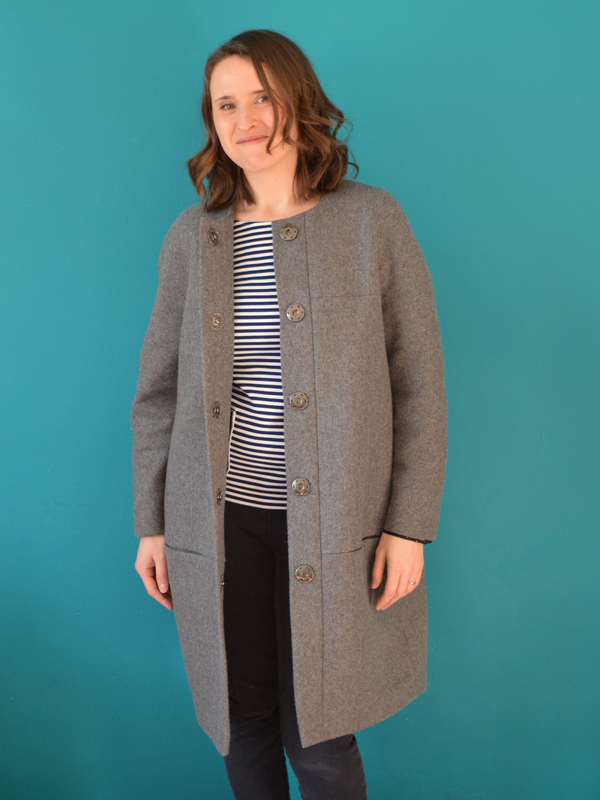 But did I mention that I made a coat? Happy 10th Birthday to 'So, Zo...'!!! Can you believe it?! Today is this blog's tenth birthday. TEN YEARS!!!!!!!!! With the odd gap of two or three weeks here and there (like, for example, immediately after the birth of my children), I have managed to consistently maintain this blog for a decade. It's a wonder to me, it really is. According to my stats, I've written 917 posts in total. Some were quick ones, like musings on an outfit in the early days, or a brief update during Me-Made-May. And others took longer to write than some of my degree coursework. Anyways, that averages out at 1.7 posts published per week over the course of this blog's life. These days, I'm posting about once a week, which is just about sustainable given my other current commitments. Last night I spent a while reading some of my very early posts (I wouldn't recommend it.) It felt so bizarre to get a peek into who I was a decade ago. Around the time I begun this blog, I was busy dismantling the life that I had grown bored of, and to start up a new one by setting off on a major adventure. I moved to Spain, with no plan, no employment, no Spanish and very little money. I had complete freedom and it felt amazing. And like my life at that time, I wasn't entirely sure what this blog was going to become (hence the vague and, in hindsight, stupid title). I knew that sewing would feature a great deal, as it was steadily becoming a bigger and bigger thing in my life. But I also wanted to use this space to explore other topics and issues that interest and influence me, which I have done to a greater or lesser extent over the years. At risk of sounding dramatic, this blog has been an amazing tool for self-discovery and helped me find my voice. If anyone is considering starting up their own blog, I would definitely recommend it. To be honest, I don't remember actually setting up this blog, but going back to my first post I saw that it was my amazing friend Silvia Sella who helped me do it. It is the very same amazing friend, Silvia Sella, who very kindly spent some of her recent post-operative convalescence designing me a new banner for the top of this blog. She also designed the fabulous logos for my sewing patterns, and I love how it looks a lot more cohesive now. To say that I'm thrilled to have this spanking new, slightly slicker and more grown up banner is an understatement. I can't thank her enough. 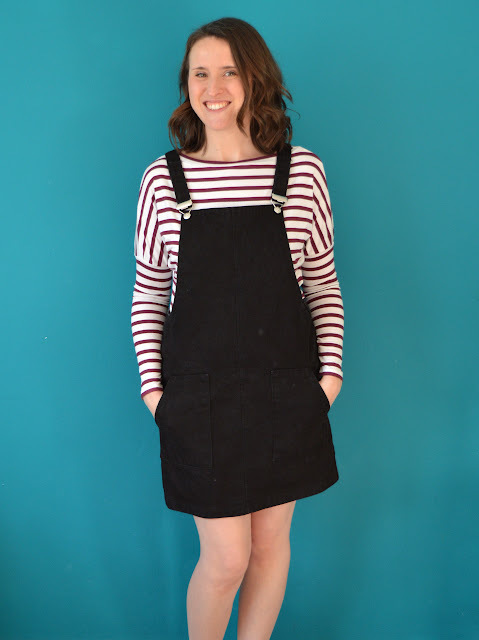 This is my monthly feature where I road test a free sewing pattern or tutorial: sometimes a children's one, sometimes a women's one (or in today's case, both). I publish these posts every first Friday of the month, timed to provide inspiration for those of you who plan to get your sew-on over the weekend. I firmly believe that, if you pick your projects carefully, sewing doesn't have to be a crazy-expensive way to clothe yourself and your family. Thanks to all the amazing pattern designers who have offered up their hard work for us to enjoy for free. Today, I'm keeping to the theme of out-of-season shorts projects. 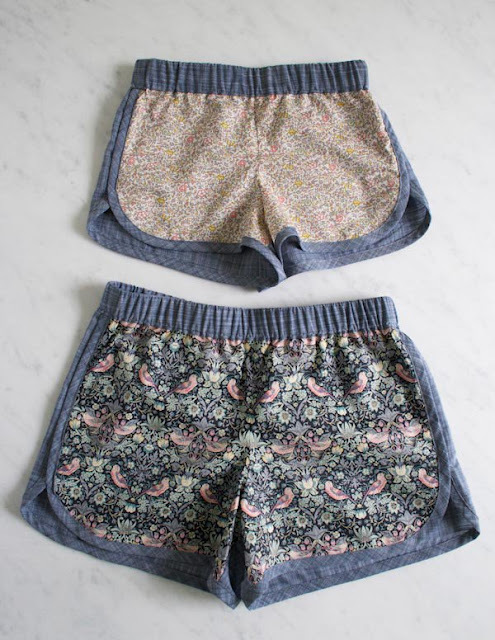 Last month I shared my stack of kid's shorts, but today's pattern is sized for women and kids. I would have loved to have made some small ones, but what with all those Sunny day shorts I've made, my kids really don't need any more shorts for the summer, so I've become the recipient of a test pair of Purl Soho's City Gym Shorts pattern. The City Gym Shorts are a retro, 70's sporty style which have been brought up to date by New York's Purl Soho with the use of fancy fabric. I was unsure if I'd enjoy wearing this style as regular shorts, so I've intended this test pair as sleep wear, which I think this pattern also easily lends itself to. It consists of just three pattern pieces (front, back and waistband) with the edges of the legs bound with bias binding. This pattern is rather generous in that it covers ages 2 to 11 years for kids, and 33" to 46" hip circumference for women. My hip measurement is 39" so I made the 38"-40" and I feel the fit around the hips is spot on. I have yet to wear them properly (what with me making these in winter and all! ), so I can't comment fully on the fit at this time. I imagine that Purl Soho released this free pattern, at least in part, to promote the fabrics they have for sale, so they link to specific fabrics on their site rather than give generic specifications on fabric choice for this pattern. I think that what you're looking for is a light-to-medium weight, stable woven fabric: cotton is going to be your best bet. It's important to make sure the main fabric has enough body to hold those crisp curved shapes on the outer leg. I've used some thickish shirting for these, but I may make my next pair in quilting cotton. The pattern suggests making self bias binding, but I didn't have enough of my main fabric so bought this floral bias binding from my local haberdashery. I recommend doing a Google image search for this pattern to see the many amazing fabric choices and combinations that have been made by other people. 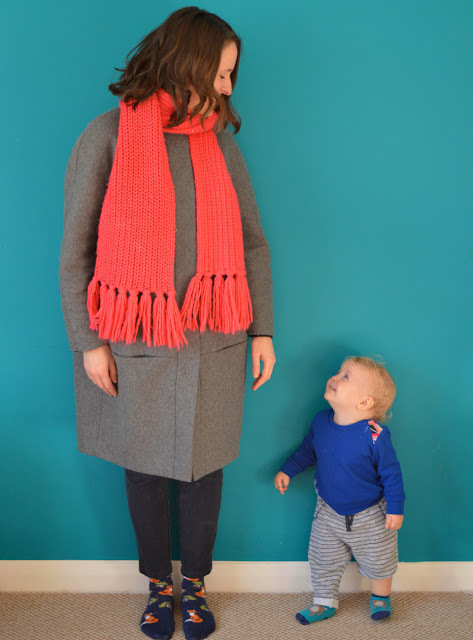 The PDF pattern files are grouped into kids' sizes and women's sizes. The seam allowance is included in the pattern, but I'd already cut out my pieces before I realised it's a scant 1/4". I'd have increased it to 1cm (3/8") if I'd realised sooner. But it was a fun and relatively speedy make, applying all the binding was the most time-consuming and fiddly part. I was hoping that I'd like this style on me enough to be happy wearing it outdoors, however I think for my proportions they aren't the most flattering garment, so I'll keep as sleep wear and pottering-around-indoors wear. Apply a trim, such as pompom trim or lace, around the leg edges. I'd be surprised if this is ends up being my final dealings with this pattern. I'm waiting for warm weather to see if I feel the rise needs to be altered for me, and then I'm sure I'll make at least one more pair to sleep in/knock about the flat in. And when Dolores has grown out of all her current shorts, I'd love to make some for her. You could go to town using up cute pieces of quilting cotton making these for kids (or adults! ).